Restoration Carpentry Contractor. 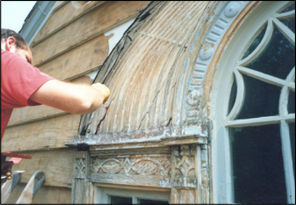 Conservation of Historic Buildings in Connecticut. Since 1974, Marlowe Restorations LLC has furnished carpentry repairs for historic structures in the state of Connecticut. Careful conservation of original historic fabric is the most cost effective way to preserve the unmistakable beauty of historic buildings or to harmoniously introduce new woodwork into an existing structure. We work with owners and architects to make sure that sound, repairable, irreplaceable historic woodwork is not needlessly destroyed. We combine intimate knowledge of our regional architecture with the most current wood preservation technology and traditional carpentry skills. Our goal is to produce the most durable repairs possible to woodwork damaged by time, exposure or neglect. We strive to meet the very highest standard for the preservation of historic architectural woodwork in the region. Marlowe Restorations LLC is a contractor with long experience in general construction and specializing in restoration carpentry and epoxy wood restoration. Our skills include state of the art conservation of timber frame structures, historic wood window restoration and general repair of historic millwork, interior and exterior. Clients committed to historic preservation rely on us to produce additions, renovations or repairs that will merge seamlessly with their existing antique buildings. We prefer to leave no mark in the historic fabric except that of the original builder. Our state of Connecticut has some of the most beautiful and historically significant architecture in the country. Tell us about your historic Connecticut building project, either by email or by phone at 203-484-9643. Paul Marlowe of Marlowe Restorations LLC is well known for his expertise in the repair of historic woodwork using epoxies. In this video, Paul demonstrates an innovative technique for the restoration of period structural timbers. In addition to executing restoration of woodwork in the field, Paul Marlowe is dedicated to developing standards for epoxy restoration through education, training and by sharing information acquired through experience.